You are here: Home / Uncategorized / PVC vs. TPO Roofing: Is the Debate Over? PVC vs. TPO Roofing: Is the Debate Over? Over the last several years, it seemed as if TPO supporters have wanted to push the membrane onto every roof. Certainly the material has done very well and gained a large market share. But other membranes haven’t gone away, and some have a fairly stable market share. It’s easy to understand why single ply hasn’t done well on smaller roofs in urban areas, with their large numbers of penetrations and often chopped-up shapes; for these roofs, mod bit (or possibly a coating system) seems like an obvious choice. What about PVC? It has a similar reflectivity to TPO and was the original weldable sheet. But there were questions about the plasticizers; what happens as they migrate out of the sheet? TPO was seen as being inherently flexible; over the years, it’s proven itself and has steadily improved in terms of weathering resistance. Manufacturers have been investing heavily in TPO but, surprisingly to some, PVC remains a viable alternative. In terms of weathering (i.e., based on the Heat Aging and the Accelerated Weathering tests), TPO has the clear edge over PVC. 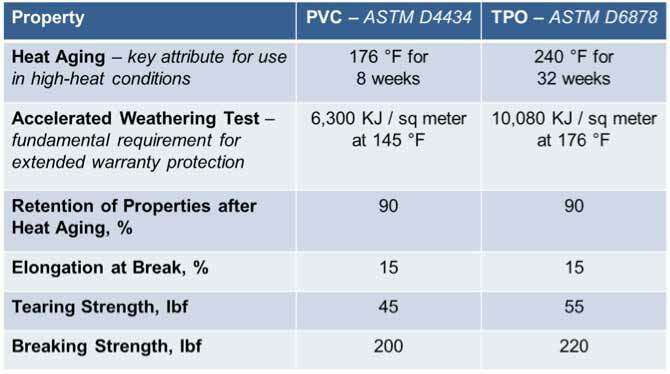 This may surprise some diehard PVC users, who may be unaware of the advances made in TPO formulation over the last several years. While TPO has superior weathering and slightly better tear and break resistance than PVC, PVC does have some characteristics that certain customers need or prefer. 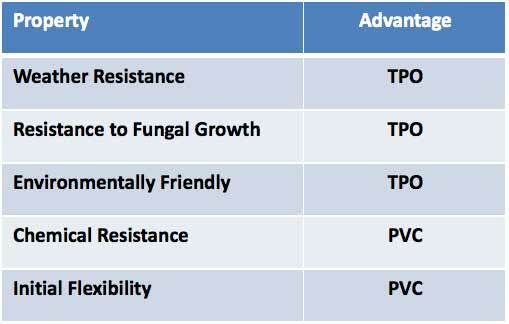 For example, PVC has better chemical resistance; it does not absorb or get weakened by oils and greases. This means that PVC is the preferred membrane for restaurants and other buildings that have grease traps on the roof. Also, PVC is slightly more flexible than TPO, which some contractors like. There used to be talk about welding differences, but both membranes weld well. TPO requires higher temperatures but, once a crew has adapted, welding is as straightforward as it is for PVC. So next time you’re debating which product would work best for an upcoming roofing job, it may be helpful to refer to the two charts above before you make your decision.